Checkers is a challenging board game that easy to learn but hard to master. Checkers is played on an eight-by-eight squared board (with sixty-four total squares) with twelve pieces on each side. 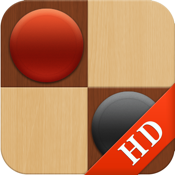 Checkers - Deluxe HD supports both 1 player and 2 player gameplay, so you can play checkers with the AI computer or a friend on your iPad. 6. Great graphics and exciting sound effects. Checkers, or draughts, can be divided into American Checkers and English Draughts, but the rule is alomost same. Two players take turn to move. A simple move involves sliding a piece one space diagonally forwards to an adjacent unoccupied dark square. If a player's piece moves into the kings row on the opposing player's side of the board, becoming a king and can move both forwards and backwards. The opponent's pieces are caputured by jumping over them. A player wins by capturing all of the opposing player's pieces or by leaving the opposing player with no legal moves. Fatbird is greatly honoured to bring you Checkers - Deluxe HD and will continue to add new features, please don’t hesitate to rate us, we love to see your support and suggestion!